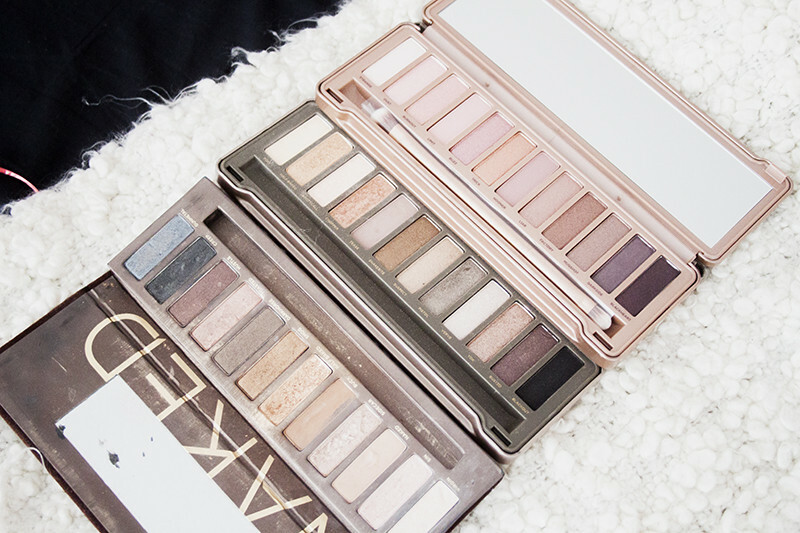 A lot of people have been asking me do a comparison of the three Urban Decay Naked Palettes so here are some photos comparing the shades in Naked 1, Naked 2 & Naked 3. I'm not going to go to deep into swatch comparisons as Temptalia has that covered already. 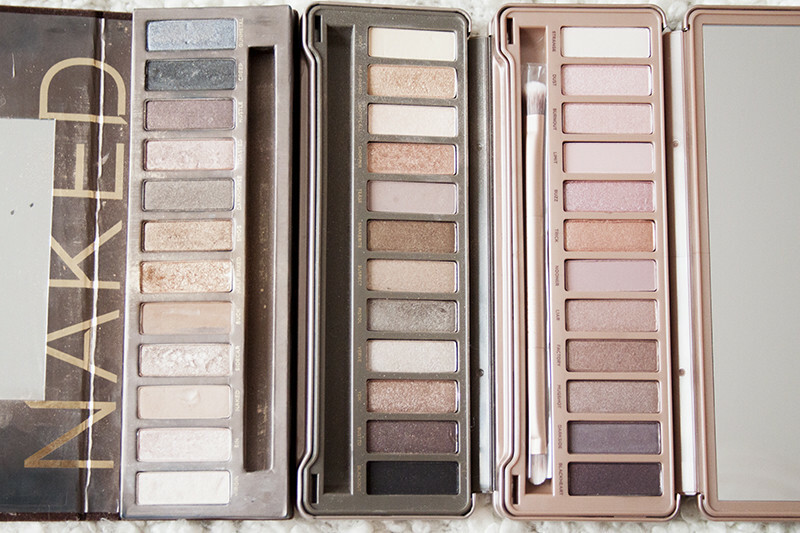 But I have to admit that Naked 3 is very different to the preceding palettes. All 12 shadows from Naked 3 are exclusive to the palette and none of the shades are TOO similar to the other shades in the Naked Palettes. I feel the rosy tones of Naked 3 are really flattering on my skin tone and they suit my colouring much better than the other two palettes. While Naked 3 is warm the only shades that worked well on me were Half Baked and Smog, the rest of the shades were too light or looked unflattering. I've hardly had any use out of Naked 2 as it's far too cool for my complexion and most of the colours looked very grey on me. I had promised myself I wouldn't buy it as I knew it wasnt going to work for me but thats the madness of a beauty blogger! While Naked and Naked2 didn't work for me, this might not be the case for your skin tone... I might do a post on which ones I recommend for different skintones/eye colours! The main differences between the palettes is that Naked 1 is more warm toned, Naked 2 is very cool toned and Naked 3 have a warm pinkish tone. I find it much warmer than the earlier palettes and all the shades are very different. Although admittedly some shades are noticeably similar from palette to palette. For example, Mugshot is a bit darker than Toasted (Naked 1) and darker than YDK (Naked 2) but very similar in tone. Strange is more matte than the other lighter shades from the other two Naked Palettes but most similar to Virgin (Naked 1) in colour but not in finish. The only shade I felt that wasnt similar at all to other shades in existing palettes is Buzz as it's pinker and more shimmery than any of the other two. While to the untrained eye there might be that much difference between the shades, There is only so many variations of neutral browns, golds and taupes you can pick from. I think Naked 3 is very different from the other two palttes in terms of shade range and colours. 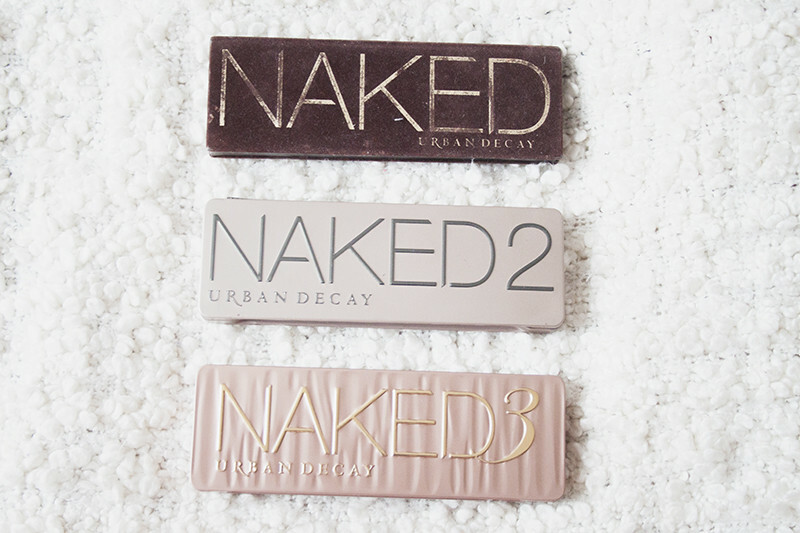 I think this is the perfect palette to sits within the Naked family. Alone it's a really strong palette but it's sort of the missing link between the other two Urban Decay Naked Palettes.